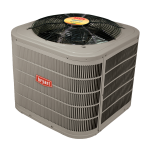 This Bryant Horizontal Discharge Air Conditioner is ideal for homes where outdoor space is limited. 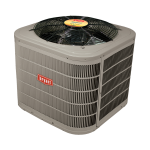 Bryant’s Air Conditioners are the premier equipment for residential air conditioning needs. This Bryant Air Conditioner is 15 SEER. 1.5-5 Ton sizes. 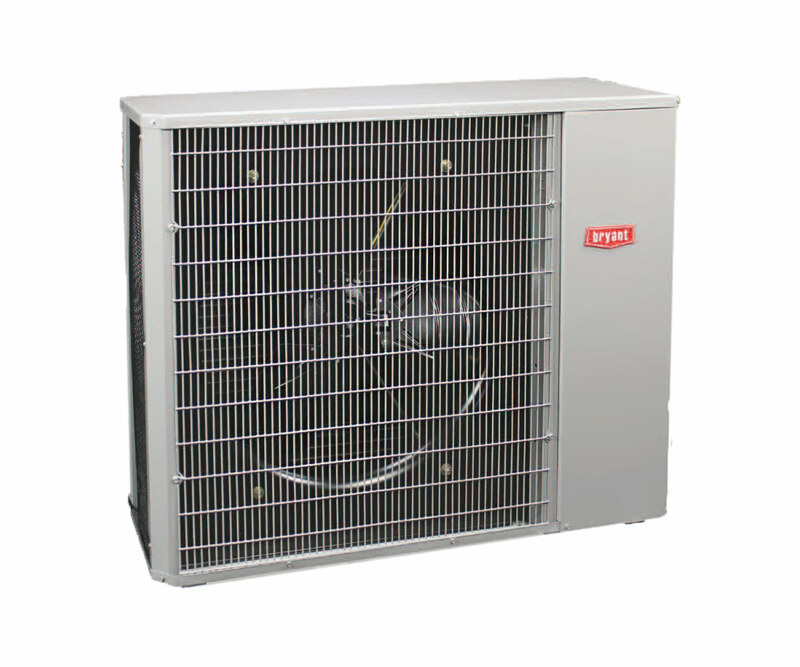 Air conditioner efficiency up to 15 SEER! Today’s air conditioners are energy efficient and built to deliver maximum performance using less electricity than in the past. Puron is an environmentally sound refrigerant that offers high efficiency and long term cost savings to homeowners. Sound level as low as 68 dBA. 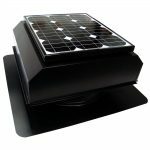 The horizontal discharge unit is sized and created to fit urban environments, smaller or zero lot lines and homes where a standard sized A/C won’t fit outdoors. Quiet and compact, it’s small size makes having A/C a reality for many who would otherwise not be able to. A great warranty lets you enjoy your comfort with confidence. Bryant builds trusted reliability into every product then provides additional peace of mind with excellent air conditioner warranty protection. 10-year standard parts limited warranty must be registered within 90 days of installation through Bryant. What factors will a Home Energy Specialist consider when sizing a new air conditioner for my home? The size of your central air conditioning equipment is measured in tons of capacity. Your home’s design, size, insulation and other factors are input into a calculation to arrive at the proper sizing for state code requirements. We follow industry standards and local code for calculating your homes heating and cooling loads to ensure you will get the cooling you hope for. My AC is running but it’s not cooling, do I need to replace it? Air conditioners, like cars need tune ups regularly. Typically an air conditioner unit should be serviced at least once a year. A service visit typically includes task such as a filter change, coil cleaning, and refrigerant fill among other things. Regular service tune ups extend the life of the appliance. In addition, you should remove leaves and debris from around the unit. To learn about putting your home’s appliances on regular service plans, check out our Guardian Maintenance program. If you’ve been neglecting regular AC tune ups, it is more than likely that the filter and coils on the air handling unit or furnace inside your house are dirty and clogging up the operation. Not only does this affect the operation of your air conditioner unit, it wears down the equipment, decreasing life expectancy. When was the last time you had someone check your duct work? Leaky ducts are common, especially in the attic area. Old ducts likely don’t need to be replaced but simply resealed and insulated. How do I know if a company is qualified to install my air conditioner? A qualified technician should be NATE certified and factory trained for the air conditioner you are buying. To protect consumers, NATE (North American Technician Excellence) formed as a 3rd party, non-profit, certification program for the HVAC industry and passing that test lets you know the person working on your air conditioning installation knows their craft. Washington Energy Services has NATE certified technicians. 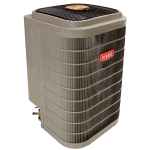 Plus our installers are all employees, and we are a Factory Authorized Bryant Dealer so we know they are receiving hours of factory training from Bryant on each of their air conditioning products.